CD (OP) ABC. 476 122-9. 2003. 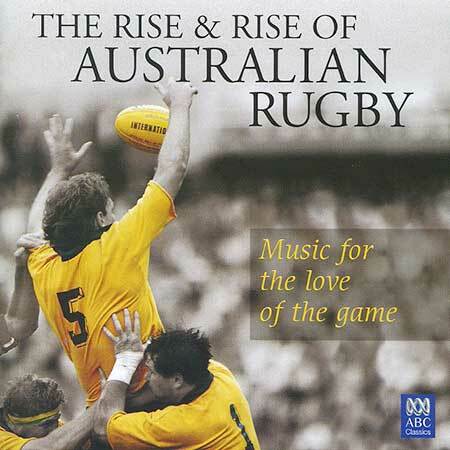 "THE RISE AND RISE OF AUSTRALIAN RUGBY - MUSIC FOR THE LOVE OF THE GAME". GUSTAV MAHLER - Fanfare Opening of 1st Movement. Symphony No.5 in C sharp minor). JOHN HUGHES - Guide me, O thou Great Jehovah - Cwm Rhondda (Bread Of Heaven). ANTONI VIVALDI - Gloria in excelsis Deo. (From Gloria in D, RV589). TRADITIONAL IRISH - Danny Boy. CLAUDIO MONTEVERDI - Deus in adiutorium. (From Vespers of the Blessed Virgin 1610). ROY WILLIAMSON- Flower of Scotland. RICHARD WAGNER - Beglückt darf nun (Pilgrims' Chorus). (From Tannhaüser). GEORGE FREDERIC HANDEL - Zadok the Priest. HWV258. EDWARD ELGAR - Nimrod. (From 'Enigma' Variations, Op, 36). ALEXANDER BORODIN - Polovtsian Dance No.17. (excerpt). GEORGES BIZET - Les Toreadors. (From Carmen Suite). GUSTAV HOLST - I Vow to Thee My Country. PETER DODDS McCORMICK - Advance Australia Fair. ANDREW BARTON PATERSON / MARIE COWAN - Waltzing Matilda - ABC-TV Sport Choir. LUDWIG VAN BEETHOVEN - An die Freude (Ode to Joy).